My interest in reading brought me to another classic “The Complete - Yes Minister” by Jonathan Lynn and Antony Jay which I have been re-reading for the past few days. My dad has an amazing collection of “delectable” books. (I know - should be food!! but hey this is “My” Blog and “My Rules”) Since I am crazy for bureaucracy and red-tapeism which my Dad “supposedly” practices daily in Office, I kind of find these books funny and humorous. I remember a time when I was probably in second or third grade that “Yes Minister” used to come in on Doordarshan. Even then I had an enjoyable time pulling Dad’s legs. Cynical no doubt. But Sir Humprey did make a point here. Of course realities today might be evaluated differently. But this coming in a comic composition almost a generation back (I have a 1997 reprint) has had me thinking. What do you say ? Not being versed in Latin, I would scarcely be expected to make meaning of this, but I will give it a try. “civis” is sometimes defined in cheap Latin dictionaries as “city-dweller”. It means “citizen” So Cives Romanus would loosely translate to “Citizen of Rome”. The reason I find this exciting is that during the heydays of the Roman Empire (2000 years ago) a Roman Citizen could walk across the face of the “known” world without fear. As President Bartlet (the protagonist of the West Wing) puts it - “So great was the fear of sure retribution for harm to a Roman Citizen” that nobody would dare hurt him. Would any citizen of any nation have the same feeling today. One might expect that an American Citizen might think so, but I am convinced that with the scourge of terrorism gripping America today, Cives Americanus would be the most insecure citizen. At what cost ? If only a Roman plutocracy could generate such a level of protection, why nothing can be done today ? “The West Wing” is a TV Series that ran from 1999 to 2006 on NBC. My all time favorite for political satire. This will be the beginning of my episode wise comments. 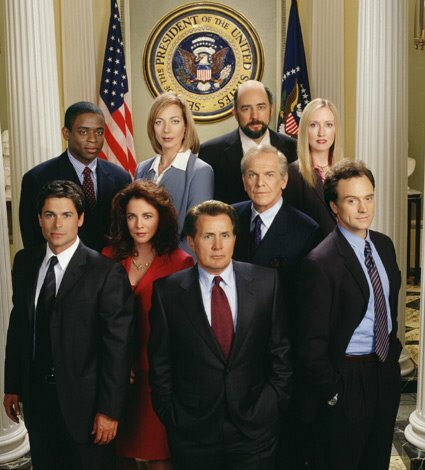 The West Wing is the series that inspired some of the more popular, intelligent drama’s that are having great success today. You owe it to yourself to check it out on DVD if you missed it when first broadcast. You won’t find a better written drama series - that’s a promise! The series tells the story of a ‘fictional’ American president, ‘Jed’ Bartlett, played by Martin Sheen and his support staff. It cleverly mixes fact (that can surely only have been provided by a White House insider) and fiction to provide gritty, funny and at times intensely moving drama. You are currently browsing the Aalap’s Vibes weblog archives for January, 2008.